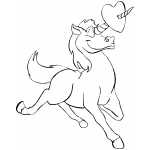 If the Magic Elf does not accompany this letter, rest assured that he or she will make themselves known to you shortly. But I strongly suggest that each member of the household commence good behavior immediately. Upon my arrival on Christmas Eve, I will review the Magic Elf's report and determine whether any and all gifts shall be delivered as planned. The report will be clear and concise, and there is no appeals process. The Magic Elf may be observing your household at any time, with no notice required. This is all under my authority as Santa Claus, and any complaints should be made in writing to my Workshop address at the North Pole. Thank you very much for your cooperation in this matter. 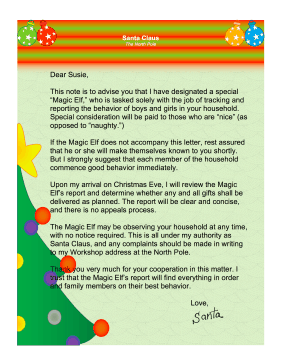 I trust that the Magic Elf's report will find everything in order and family members on their best behavior.